The first step in becoming a successful, independent consultant may surprise you. Before I tell you what it is, let’s start with a couple of quizzes. It doesn’t matter whether you get these “right” or “wrong”… it’s just for fun (and reveals how different people think). You’ll see the results after you submit your answer. Let’s start with the answer to Quiz #2. Your most valuable consulting asset is actually… (drumroll please)… a tie between “Your proven, business development approach” and “Your client base.” In the world of consulting M&A, firms that have a strong client base and/or proven revenue development are valued more highly than firms with unique offerings or “breakthrough” IP. Why? 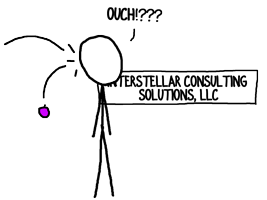 Because you can stand anywhere, throw a plum and hit a consultant who has a “unique” offering or a breakthrough idea. Hitting a consultant whose contact list is dripping with decision makers or who has built a replicable, reliable revenue stream takes good aim and a peck of plums. When the boutique firm I was part of in the late 1990s was purchased by a big ad agency it wasn’t because of our amazing technical prowess; it was because we had access to decision makers they couldn’t reach. The most successful consulting firms in the world pretty much all do the same thing. They’re not selling uniquely great offerings. They’re uniquely great at selling mundane offerings. Step #1 for becoming a successful consultant is determining who you’ll target! That’s right. Before you determine your offering or your IP or build your skill set, first identify who will be buying your consulting services. Now, what’s the most important attribute in determining your target? That they’re decision makers? That they need what you offer? Nope. The most important attribute of your consulting target is that you can reach them! A decision maker you can’t reach is an avatar, not a prospect. In contrast, virtually every business executive you can reach has the authority to buy something. Once you start selling to them, then you can build on your success by expanding your reach and/or your offerings. 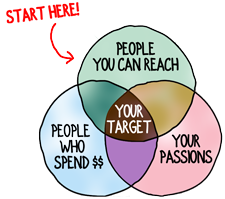 Your ideal target is at the intersection of People You Can Reach, People Who Spend Money on an Offering You Can (Learn to) Provide, and Your Passions/Interests. Of those three, your passion and interests are the least important. You’re a curious, knowledge-hungry consultant and I’m sure you can develop a passion for the nuances of virtually any subject. In an upcoming blog post I’ll dig a bit deeper into developing a target that will make you a wealthy consultant, and cover some of the common fears, myths and misconceptions. What’s your biggest concern about defining a narrow target for your consulting practice? There are a lot of decision makers but analyzing their needs are crucial before providing solution. How can one carry out such analysis and select the best need that can fetch more cash inflow. 4. Present your offering in a convincing manner, either through a conversation or a mail. Absolutely right. You’ve captured the steps exactly. (Though it’s rare you’d be able to sell a large consulting gig via mail. A conversation is needed at some point.) Well done, Tayo. Greatest fear about a narrow target niche is limiting my revenue dying downturns. When budgets dry up in one area of my practice, I am able to pivot to a related area; e,g,, external marketing to internal change management. Similar skill sets applied with a slightly different focus. Worries about revenue are the most common concern, and I’m glad you brought the topic up, Richard. As you pointed out, you can solve slightly different problems for the same, narrow target to keep cash flowing. While there are definitely industries and niches that dry up or go through down cycles (currently petroleum, for instance) for most independent consultants the market is so large that our fortunes can rise even when our clients’ markets are taking a dip. Really enjoy your insight. Target + reach = approach > client = engagement. My mantra is: Simplify, prioritize, execute and repeat! Nice formula, Felix. That’s a handy encapsulation of the idea. Thanks for sharing it! This subject and the suggestions you made are right on the mark. It is so easy to spin your wheels as an independent consultant and your message gives solid traction. Thank you, Tom. As experts, it’s especially easy for us to get caught in our own expertise. Before we know it, we’re thinking the world will adapt to what we have to offer, instead of the reality: we must always adapt and be willing to let go of who we think we are to become who we want to be.